In full or semi-automated processes in the food industry, product weight has become increasingly important. Processing speed, accuracy, reliability, networkability and ease of operation in a rugged environment are the key criteria for food inspection equipment. All checkweighing equipment has to fulfil the same high pace as the rest of the modern production machines. 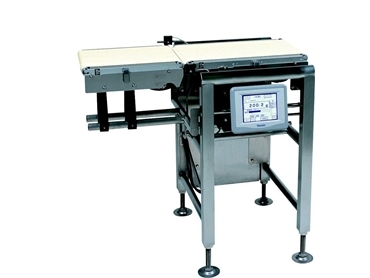 The Yamato CH Series checkweigher range can accurately weigh items ranging from 1gm to up to 50,000gms, with all the necessary features required for the Australian and European checkweighing standards. The low capital cost of the new CH Series Yamato checkweigher will also save money for customers, who would consider purchasing second hand systems, due to the extensive free parts and labour warranty period offered by the exclusive Australian agents, Autopac Systems . Ease of product set-up: Yamato uses a wizard feature, when setting up a new product to be weighed. The operator is asked a few questions by the checkweigher and answers them using the standard pressure sensitive touch screen on all models. The checkweigher then intelligently calculates the speed of the conveyors, the correct weighing time and the correct reject timing, and automatically adjusts them for optimum performance. The new product programme can then be recalled at any time, and the checkweigher will automatically make all the pre-programmed adjustments in seconds. 100 different programmes can be stored in this manner. High accuracy at high speeds: Yamato checkweighers (CH) are suited to many food manufacturers for speed and accuracy. Floor or adjoining equipment vibration in the manufacturing environment, which can affect weighing accuracy, is also mitigated with Yamato's advanced digital filter. HACCP design approval: For food plants wanting to gain or maintain HACCP approval, are watchful to make sure that any new equipment being installed complies with these regulations. Yamato checkweighers meet this standard design using tubular stainless steel frames to prevent product and dust build-up. Conveyors and conveyor belts that detach without tools, add to the compliance regulations. Gathering of statistical data and network capabilities: ARC NET and ETHERNET communication enables data acquisition with multiple stations and allows for remote control operation. Histograms, average weights, standard deviations and product totals are only a few of the statistics that can be collected either via the checkweighers' touch screen, attached printer or from a remote PC at any given time.